Merry Christmas Romania! Have a free democratic state, a dictator’s corpse and a happy new year! 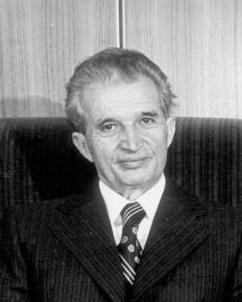 One of the most vicious dictators of the Communist era, Nicolae Ceauşescu is perhaps second only to Stalin in sheer numbers of his own people that he had executed. He was the President of Romania for more than 22 years, and in that time, he made a lot of enemies, chiefly among his own citizens. The 1989 revolutions across Eastern Europe gave inspiration to Romanians, and on December 16, an uprising began in Timişoara in response to yet another attempt by the Ceauşescu regime to stamp out religion. By December 22, Ceauşescu and his wife Elena were attempting to flee the country, but to no avail. On Christmas Day, they were tried and sentenced to execution. The Ceauşescus were killed by a three member firing squad. They were not much missed. Tagged 1989, Communism, Dec 25, Jesus Jones, Nicolae Ceauşescu, revolution, Right Here Right Now, Romania.